Background: The unstable and/or toxic degradation products may form due to degradation of drug which results into loss of therapeutic activity and lead to life threatening condition. Hence, it is important to establish the stability characteristics of drug in various conditions such as in temperature, light, oxidising agent and susceptibility across a wide range of pH values. 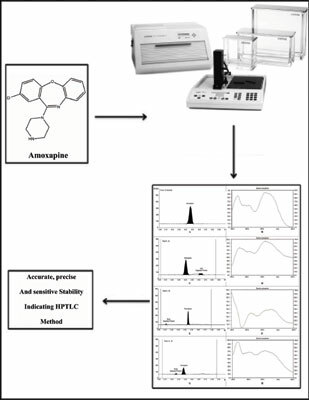 Introduction: The aim of the proposed study was to develop simple, sensitive and economic stability indicating high performance thin layer chromatography (HPTLC) method for the quantification of Amoxapine in the presence of degradation products. Methods: Amoxapine and its degraded products were separated on precoated silica gel 60F254 TLC plates by using mobile phase comprising of methanol: toluene: ammonium acetate (6:3:1, v/v/v). The densitometric evaluation was carried out at 320 nm in reflectance/absorbance mode. The degradation products obtained as per ICH guidelines under acidic, basic and oxidative conditions have different Rf values 0.12, 0.26 and 0.6 indicating good resolution from each other and pure drug with Rf: 0.47. Amoxapine was found to be stable under neutral, thermal and photo conditions. Results: The method was validated as per ICH Q2 (R1) guidelines in terms of accuracy, precision, ruggedness, robustness and linearity. A good linear relationship between concentration and response (peak area and peak height) over the range of 80 ng/spot to 720 ng/spot was observed from regression analysis data showing correlation coefficient 0.991 and 0.994 for area and height, respectively. The limit of detection (LOD) and limit of quantitation (LOQ) for area were found to be 1.176 ng/mL and 3.565 ng/mL, whereas for height, 50.063 ng/mL and 151.707 ng/mL respectively. Conclusion: The statistical analysis confirmed the accuracy, precision and selectivity of the proposed method which can be effectively used for the analysis of amoxapine in the presence of degradation products. Amoxapine, HPTLC, stability indicating, validation, stress degradation, TCA.